My home site just outside of VC37. 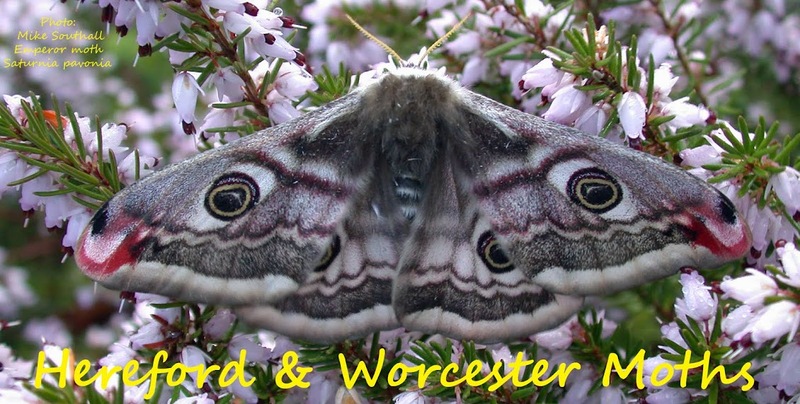 Worcestershire but, by a quirk of the VC37 boundary, just in VC33 Gloucestershire, I am constantly having to remind myself that my garden records are outside what I still consider my 'home' county. This can be frustrating when interesting species turn up which have not been recorded in VC37 for some years but are considered unremarkable in VC33. 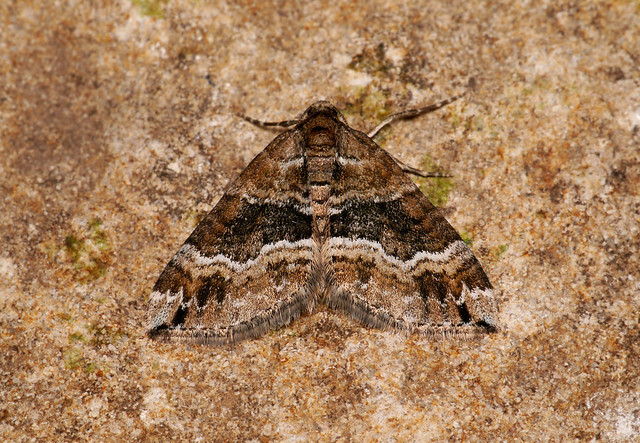 Barred Rivulet Perizoma bifaciata was last recorded in the county in 2004. I doubt it was ever common but it seems to have disappeared from most of the county over the last decade. The most recent records are from the outskirts of Birmingham and the Defford area at the other end of the county. It was recorded from Monkwood in the past but I never saw it there in the 5 years I trapped the site regularly. 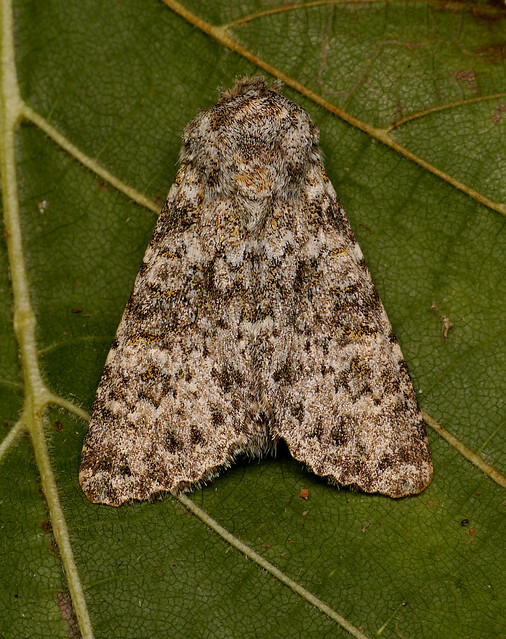 Large Ranunculus Polymixis flavicincta would have to be considered extinct in VC37 since the last record was back in 1956, but I caught one on 30/09/14. The old records are from the Malvern Hills area and Knightwick. Given that my site here is almost completely surrounded by Worcestershire I figure it is likely to be still hanging on within the county down here somewhere. One moth I was expecting down here did not turn up. Privet Hawk seems to be on the edge of its range here but with increasing sightings in south VC37 over recent years and a Pair in cop found on the Windmill Hill reserve in 2014, I was hoping to see one in the garden trap. Maybe this year! One of the thing I definitely want to do this year is find a spot just into VC37 where I can trap regularly! Well, that's good to know. If the Peplows are reading this, Pleeease send in your records! Barred Rivulets are still doing OK on the Woolhope Dome in VC36 having been seen the last two years in Haugh Wood and also at Aylton in an area of horse pastures. Let's hope it reappears in Monk Wood following the ride improvements. I had a look at the VC37 records for Barred Rivulet and realised my only record for the species, at Penorchard Meadows 10.7.05 is not on Mapmate (it is on my original Excel file). 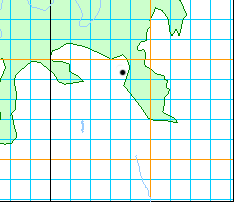 I have added it to Mapmate for next sync. Hi Jason - Good to see you on the Blog. and very good that this has shaken out two more records for VC37.